PULLMAN, Wash. – The potential healing property of chemicals found in nature was addressed by two Washington State University faculty members recently at a scientific seminar in their home country of the Philippines. “There was overwhelming interest among faculty, staff and students on the role of natural products in drug discovery and development and how we are advancing the field at WSU,” said Doralyn Dalisay, assistant research professor in the WSU Institute for Biological Chemistry. “They too have outstanding ideas and research but lack the facilities and equipment to move things forward,” said Jonel Saludes, assistant professor in organic and bioorganic chemistry. “I envision collaboration where WSU could help them identify and determine the structure of the compound(s) responsible for the desired bioactivity. Interest in obtaining biologically active compounds from natural sources has increased for a variety of reasons, including concerns that habitats worldwide – and their chemical-harboring unique flora and fauna – are being lost to development. Also, these compounds typically offer low toxicity, biodegradability, renewable availability and low cost. Saludes’ research (http://www.saludeslab.org/) is focused on the interface of chemistry and biology, particularly understanding protein-protein interactions for diagnostic, drug and biotechnology discovery. Dalisay works on drug development and natural products. Both are well-published, well-cited scholars and have patents pending. The Office of International Programs connected the faculty to WSU alumnus Ofero Caparino, from the Philippines, after he visited WSU last year to discuss potential collaborations, knowledge transfer and training activities between WSU and the Philippines. 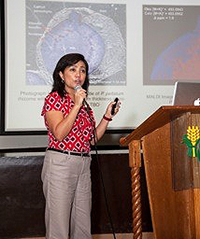 Saludes and Dalisay spoke at the “Seminar on Cancer Biomarker and Plant Natural Products Discovery” organized by the Department of Agriculture’s Philippine Center for Postharvest Development and Mechanization (PhilMech), located in central Luzon, one of the major islands of the country. The seminar drew about 140 participants from nine area research institutions. The two also gave seminars in three academic institutions in the southern Philippines and in Manila.